Syukuro (“Suki”) Manabe in the 1960s at Princeton University, New Jersey, where he taught from 1968-1997. He was working on weather prediction in Tokyo during the difficult postwar years when he was invited to come to the US Weather Bureau’s unit working on the general circulation of the atmosphere. 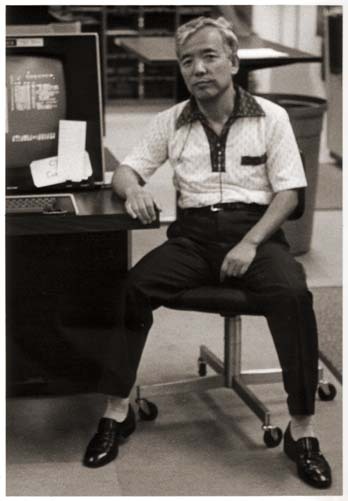 He was assigned programmers to write computer code so he could concentrate on the physical concepts and mathematics. Image copyright: AIP Emilio Segrè Visual Archives, used with permission. In 1963, using one of the world’s first transistor-based supercomputers, Syukuro Manabe was supposed to be simulating how Earth’s atmosphere behaves in more detail than ever before. Instead, the young US Weather Bureau scientist felt the frustration, far more common today, of a crashed system. But resolving that problem would lead ‘Suki’ Manabe to produce the first computerised greenhouse effect simulations, and lay the foundations for some of today’s most widely used climate models. After growing up during the Second World War, studying in bomb shelters, Suki entered the University of Tokyo in 1949 to become a doctor like his father and grandfather. The same year Japanese physicist Hideki Yukawa won a Nobel Prize, and helped drive many students into his subject, including Suki. “I gradually realized, ‘Oh my God, I despise biology,’” he told interviewer Paul Edwards in 1998. But to start with, he wasn’t very successful in his new subject. “At the beginning my physics grade was miserable – straight C,” he recalled. Those grades came about because Suki’s main interest was in the mathematical parts of the subjects, but he hadn’t been thinking about what the maths really meant. When he realised this he concentrated on the physics he found most interesting, in subjects related to the atmosphere and oceans, and his grades started to improve. “By the time I graduated from geophysics and went on to a Master’s course at the University of Tokyo, I was getting a pretty solid way of thinking about the issues,” he said. Suki went on to get a PhD, but when he finished the kinds of jobs in meteorology he was qualified for were hard to find in Japan. But he had applied his interests to rainfall, in an approach known as numerical weather prediction pioneered by scientists like John von Neumann, Carl-Gustaf Rossby and Bert Bolin. Another leader in the field, Joe Smagorinsky, was looking at rainfall in a similar way, and had read Suki’s research. Joe was setting up a numerical weather prediction team at the US Weather Bureau in Washington, DC, and in 1958 invited Suki to join him. Their early models split the world into grids reaching into the air and across its surface, calculating what happens within and between each cube as today’s versions still do. But Joe wanted Suki to go further in preparation for the arrival of a transistorised IBM ‘Stretch’ computer in 1963. Joe wanted to develop complex system models that included the role of water movements, the structure of the atmosphere, and heat from the Sun. In particular Joe wanted to push from simulating two layers in the atmosphere to nine. So as well as adapting to the US, and fixing the programming mistakes that arose, Suki had to develop new ways to simulate climate physics on their existing computers. For example, he had to create ‘parameterisations’ from direct measurements to stand in for processes smaller than the cubes in his grid, making them as simple as possible. Under these combined stresses, Suki came close to a nervous breakdown, avoided only narrowly thanks to the arrival of less error-prone programmers. When the Stretch machine arrived in what had become the Geophysical Fluid Dynamics Laboratory (GFDL) of the National Oceanic and Atmospheric Administration (NOAA) its response to the calcuations was similar to Suki’s. It became unstable and crashed. And Joe was suddenly away a lot, organising the Global Atmospheric Research Programme alongside Bert Bolin and others, which would collect data needed to build better models. That left Suki in charge of trouble-shooting, feeling bad that the expensive new computer was sat around idle. So he started simplifying the calculations enough to get it working. “I just single-handedly tossed off some complexity every time he was travelling,” Suki remembered. One element of the physics their general circulation model (GCM) needed was the greenhouse effect, not to study global warming, but to simulate how heat spreads through the atmosphere. “Greenhouse gases are the second most important factor for climate, after the Sun,” Suki explained. “They warm Earth’s surface by as much as 30°C.” But modelling the greenhouse effect using approaches concentrating on heat radiation from some of the scientists most important in highlighting it, like Guy Callendar, caused big errors. Including the magnifying effect of water vapour into the radiative heat budget of the Earth’s surface, sometimes doubling CO2 would cause 10°C cooling, other times it would cause 15°C warming. The problem, Suki realised, was that the models needed to look at more than just heat energy in the form of radiation. Scientists had recently realised that processes related to clouds, called cumulus convection, moved heat upwards from the Earth’s surface into the low atmosphere above, the troposphere. When water vapour in clouds turns into rain it releases latent heat, which can cause a temperature rise known as sensible heat, in the upper troposphere. Suki therefore included cumulus convection and large-scale atmospheric circulation, which also helps heat flow upwards in similar ways, in his models. 500K – what does that get you today? Doing this was so complicated at the time he and teammate Richard Weatherald used a single column of air to model the whole planet’s atmosphere. But the approach, published in 1967, did provide a stable early answer to the question of what effect doubling the level of CO2 in the air would have. They found the amount of warming at Earth’s surface this caused, known as climate sensitivity, would be around 2°C. That was just a third of the first estimates made by Svante Arrhenius. The approach was basic, and without more data it couldn’t be confirmed, but it was a start. 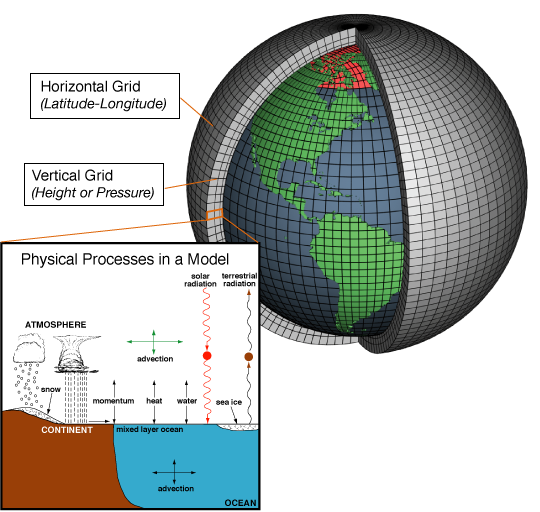 Up to that point, Suki’s atmosphere models had been kept separate from ocean models built elsewhere in GFDL by Kirk Bryan. But because oceans can store a lot of heat energy global warming is slower than it would be without them. This fact made Kirk and Suki realise they had to come together. They set up a calculation that would first work out the condition of the atmosphere, then use the results of that stage to model ocean processes. Then, in a final stage it allowed interaction between the atmosphere and ocean. 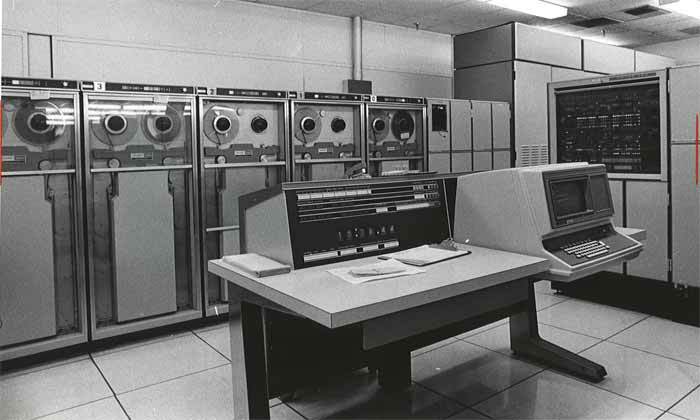 It needed to be simple, as the Univac 1108 computer they were now using had just half a megabyte of memory – smaller than most modern digital photographs. As a result the calculation had to be run for 50 days continuously. That marathon effort would be selected as one of the top 10 achievements in NOAA’s 200 year history in 2007. Running the model for weeks on end took both optimism and vigilance. The scientists monitored it closely to ensure factors like heat and water vapour levels stayed in balance worldwide, Suki told me. “Although we did our best to construct a bug-free program, it is practically impossible to prove that it is absolutely bug-free,” he stressed. Their success marked a turning point in his career – afterwards he would focus more on using ocean-coupled models to study global warming than building them. This is the first part of a two part profile. Now read part two. Apart from the quotes in the last two paragraphs, which are from questions I asked Suki directly, all the quotes in this blog entry are from an interview of Suki Manabe by Paul Edwards on March 14-15 1998, published by the Archives for the History of Quantum Physics Collection, Niels Bohr Library & Archives, American Institute of Physics, College Park, MD USA. They are copyrighted by the AIP, and used here with its permission. Thanks for this information. He is one of many who foresaw our problem. It is good of you to get their story out more. Loving the Leonard Nimoy voiceover! But it’s a bit unforgiving of you to still hold a grudge over an idea that’s 35 years old – I was 2 when this programme was made! How much have you looked into why people thought this was going to happen? It’s really interesting stuff and part of the point of this series of historical/biographical entries is to explore the evolution of climate theories like that. There are three key elements as I see it. One is the slight global cooling that went on from the 1950s to 1975, thanks largely to sulfate aerosol pollution, produced by burning coal, that reflects the Sun’s energy back out into space. One idea to fight global warming through geoengineering now is to deliberately put sulfates into the air, though it’s seen as risky. 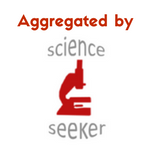 Another element is that scientists at this point had only just got direct data on the sequence of historic ice ages. That helped confirm the Milankovic theory of how they’re largely driven by changes in Earth’s orbit. That theory suggests that today we should be very slowly slipping towards an ice age, when temperatures in 2013 so far are in fact 0.6°C higher than the 20th century average. According to NOAA October was the 344th consecutive month with a global temperature above the 20th century average (the last time it was below that average was almost as long ago as when this video was made!). But in 1972 this really worried some scientists, who wrote to Nixon in warning. However, around the same time scientists like Wally Broecker suggested the warming effect of CO2 might be about to burst through – as indeed it did. All of these things happened in the 1970s, and in the time since the evidence for human-driven warming has grown ever stronger. Science is supposed to be able to come up with ideas, test them, and reject them when they’re wrong. By contrast, my experience is that we as people don’t do this quite so easily – as you say, you’re unlikely to be convinced. But to me, the reasons behind why we thought an ice age might be coming fit well with the modern warming consensus.